Any other day, attorney Audra Schaeffer might have been flattered by the friendly overtures of Robert Garfield--a real-life movie star. But on the flight from Indianapolis to Hollywood, Audra can think of little else than finding her missing sister. When Audra arrives in the city of glitz, glamour, and starts--and learns her rising-starlet sister has been murdered--all thoughts of a romance fly away. Determined to solve the mystery and find justice for her sister, Audra takes a job with the second Hollywood Victory Caravan. Together with the handsome Robert and other stars, she crisscrosses the southern United States by rail in a campaign to sell war bonds. When other mysterious events unfold, Audra realizes that if she doesn't get her emotions back on track where Robert Garfield is concerned, she could be flirting with danger! Social networking is a great thing. One day, I was on Twitter, and got an @audrajennings. "Thought of you when posting about Cara Putnam's new book - main character is Audra :)" from Rel at Relz Reviewz from the land down under.Knowing Cara since she also blogs and reviews books for us, I post on her Facebook wall that I heard she had written a book with a character named Audra. Cara said she'd get me a copy when her author copies came in. 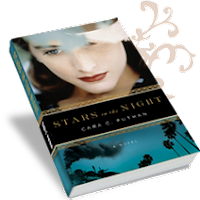 If it weren't for networking with bloggers and social networking, I may not have ever found out about Stars in the Night and gotten a chance to read it. I'm so very glad that Cara sent it to me. (I felt kind of bad going to her about it because I really don't seek out people as my own personal Amazon.com. If I come across a book I want to read offered through a blogger program, that's one thing, but I normally don't ask.) I've never read a book about an "Audra" before, so thought it would be a neat thing. I'm usually a little hesitant to read anything not written in the present day because I just don't usually enjoy anything historical, but the author's words transported me back in time and described the setting in so much detail that I found it both fascinating and entertaining. I didn't know anything about the Hollywood Victory Caravan during World War II. I never gave much thought about the difficult and bumpy ride of making it across the country in an airplane in the 1940s. Also, after watching NCIS: Los Angeles and Law & Order: SVU, you forget about the days when you couldn't just pull up a traffic cam and solve a crime. Detectives had their work cut out for them when it came to solving a mystery. Audra runs across, then tours the country with a group of actors and entertainers about to have their break into being really big Hollywood stars with their footprints in front of the Chinese theater. (Lucy would have a ball chasing after all these stars.) But Hollywood is a much different place and way of life than back home in Indianapolis. Against the advice of the police, Audra does a little investigating of her own, and it almost gets her in major trouble - but not in the Lucy way - in the serious trouble way. Is the actor that Audra is falling for the one person she should fear the most, especially when the killer strikes again? Cara Putman had my attention and kept me guessing the entire time! The one thing I wish had been explored more was Audra's journey to becoming an attorney and how the pursuit of her career worked out. There's a tease to the latter at the end. 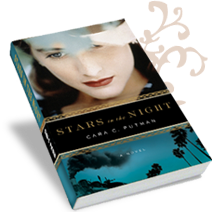 History, suspense, romance, there's some of it all in Stars in the Night. Check it out for yourself!